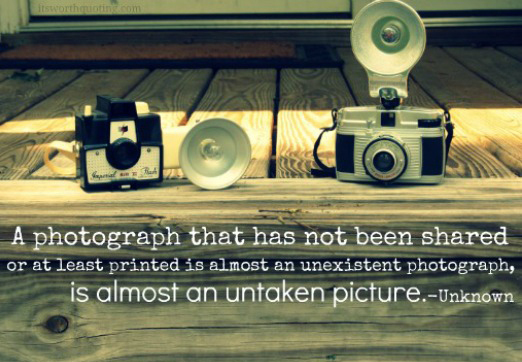 It’s ironic that we take more photos than ever before but make very few prints. Although It is wonderful that we document our lives this way and have images on our phones and computers, we need to be mindful of what could happen to those images in the future. Hard drive crashes: It is only a matter of time before your hard drive crashes. It’s not a question of “will it crash?” but “when will it crash?’ If your precious memories of a trip to Disney-world or your child’s first birthday are stored on your computer, it is only a matter of time before those images will be lost. Technology changes; 100 years from now we might not be able to use DVDs. Remember VHS and floppy disks? Having your images backed up on DVDs is no guarantee that they will be safe. 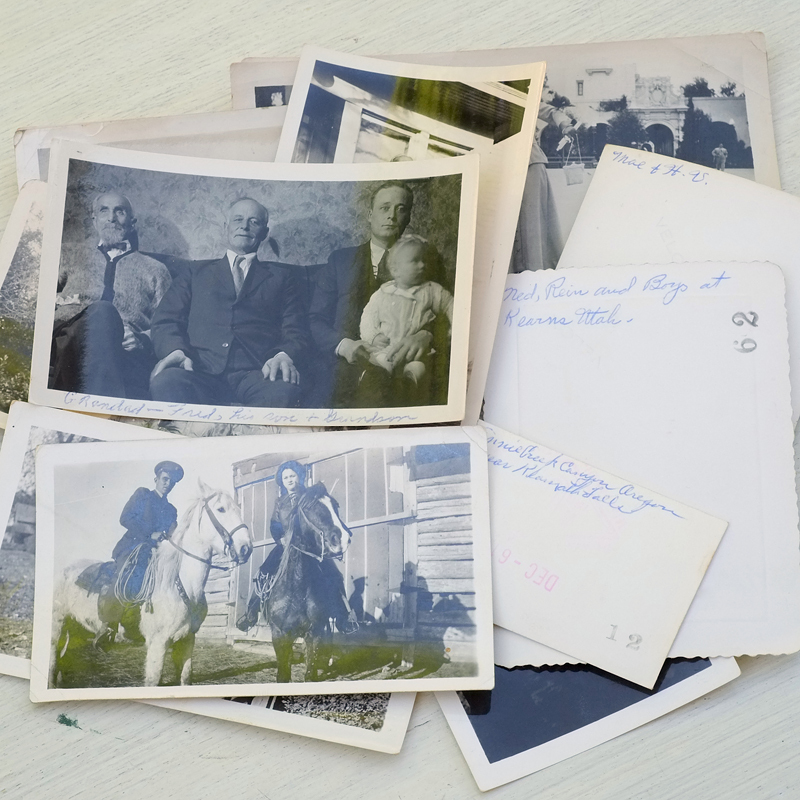 Sharing Memories: There is something special in sharing a print with a friend or relative, with having prints on display and with passing them down to the next generation. Giving someone a DVD of images does not have the same sentimental value as giving them a photograph. Photo books: Photo books are easy to put together and relatively inexpensive. I recently saw a “little black book” done at Black’s Photography and it looked great! Other places for photo books are: Costco, My Publisher, Blurb and Shutterfly. Online Print Ordering: I order all of my prints online. I use Don’s Photo Pro Lab for professional prints and Costco for others. In one of my photography classes, we had prints made at 17 different labs in the city. There was a wide range in quality, with the Pro labs doing the best jobs and drug store kiosks and Walmart the worst. Costco does a reasonably good job. Don’s Photo, Lab Works and Photo Central have great products and guarantee the results. With prints, as with most things in life, you get what you pay for. I can help you produce a photo book. Send me an email (chrismcwilliamsphotography@gmail.com) or phone me (204-962-3424) and we can discuss what your needs are. I’ll be happy to give you a quote for your photo book. I am offering a print coupon for prints ordered from my website only. The coupon code is “printdiscount.” and is valid from April 12th till the 30th. The coupon gives you 50% off prints and for the first time ever, it is including the shipping! Don’t delay using this coupon. Prices will go back to normal in May! Iphoneography is the art of creating images with your iPhone and one of Manitoba’s premier photographers is an expert at this art. Alexander Morrison was Canadian Photographic Artist of the year in 2009 and has won many Manitoba Photography Awards. Some of her award-winning images were shot and edited with her iPhone! This is a perfect opportunity to get the most our of your iPhone Cameras. It’s a full day workshop for only $59.00. Here’s the link for registration. Hope to see some of you there! There are a lot of photographers out there doing what is called “snap and burn” photography. I wrote a blog post some time ago on this topic: https://chrismcwilliamsphotography.wordpress.com/2012/10/17/snap-and-burn-photography-winnipeg-portrait-photographers/. Snap and burn photography became popular after the advent of the digital camera. Everyone became a photographer and some now offer their services for one low price, which includes the session fee and the images on a DVD. So why choose ChrisMcWilliamsPhotography when there are cheaper alternatives out there? I know kids. I’ve spent most of my adult life teaching them or photographing them and I know how to communicate with them. I know photography. I’ve taken a lot of classes and have kept up with the latest technology and techniques. I make the experience easy. Sessions are fun and galleries are online for you to view in the comfort of your home. You have 2 weeks to place your order. No pressured ordering meeting. No minimum order. I guarantee my product. It you are not happy with your session, we will do it again. No questions asked. Here’s an example of the difference between an original image that would might get from a “snap and burn” photographer and a fully edited image. Is it worth the difference? I think it is. Spring is finally here and I know a lot of you will want to update your family photos. I want to remind you that I will honour the Groupon price of $55 per session for former Groupon clients or to anyone who subscribes to this newsletter. I book about a month ahead of time, so let me know if you are interested in booking a session in May. (Please note that this price is only good for groups of 6 or less).